What’s the State of Talent Acquisition In 2016? When it comes to hiring managers, agency recruiters have a lot in common with their counterparts in the corporate world. Both are discouraged by the openness of hiring managers to non-traditional candidates. And both groups are discouraged by the workforce planning. 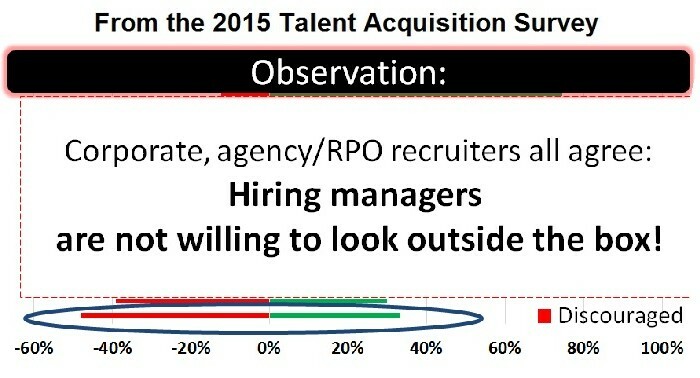 Those are but two of the findings of last year’s State of Talent Acquisition survey. Here’s another: Corporate recruiters average 100 hires annually. 2,500 recruiters from staffing firms, agencies, RPOs and in-house corporate teams gave us 10 minutes of their tim e to complete the 2015 survey. Now we’re asking for 10 more minutes to take our 2016 Talent Acquisition survey. This year’s survey is especially important because it will give us three years of data to examine so we can let you know what’s trending in talent acquisition. We’ll release the results at the upcoming ERE Recruiting Conference in Las Vegas (April 6-8), which, appropriately enough, will focus on how data can improve your talent acquisition program. Everyone who completes the survey can also have us email you the key summary results. And we’ll be reporting the results on ERE.net.